AlphaCard carries a comprehensive selection of ID products from all major printer manufacturers in the ID industry including Magicard, Datacard, Fargo, Zebra, and Evolis. Learn more about the names behind the printers, systems, and supplies. 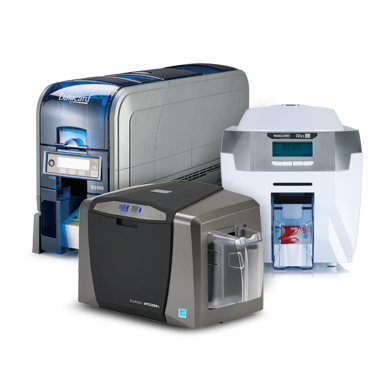 Magicard produces a range of ID card printers from entry level models to secure, high volume models. The defining characteristic of Magicard printers it their unique HoloKote watermark-like system. Datacard printers feature a wide range of options, card encoding styles, and security features - including the powerful tactile impression on their SD460 line of printers. Fargo ID card printers are designed for everything from basic ID card printer to secure, high definition, high-volume printing needs and have a range of upgrades including dual-sided printing, lamination, and encoding. Zebra ID card printers are designed to quickly and efficiently produce high quality ID cards. With their modular design, Zebra printers are easy to upgrade to match your organization's needs. With their reliable performance and stylish looks, Evolis ID card printers will easily fit into any organization. Choose from mid-level to high volume printers in both single and dual-sided models.